Beauty is just one of the many benefits of owning a DECRA roof and ageless beauty is the most important. 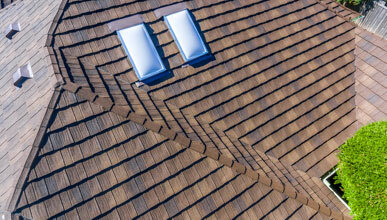 If appearance is important to you, a beautiful, low maintenance roofing solution like DECRA is a great choice for you. We are committed to manufacturing an environmentally sustainable product. Made of steel, DECRA roofing is durable, longlasting and recyclable at the end of life. A durable, long-lasting recyclable product equates to less future raw materials being used to make new products. Additionally, installation over existing roofing materials is possible, thereby diverting old roof materials from landfills. DECRA Shake XD offers the classic beauty and architectural detail of a thick, rustic, handsplit wood shake combined with the superior performance and longevity of steel.